Lewis Hamilton (Mercedes AMG Petronas) makes a historic achievement today at Circuit de Spa-Francorchamps in the qualifying for the Belgian Grand Prix, scoring his 68th pole position in a career in his 200th start in the Formula One World Championship. With this pole position, Hamilton equals Michael Schumacher on the top of all-time pole winners list. Lewis Hamilton opened the qualifications with the fastest lap (1.44.184) in the Q1. Five slowest qualifiers in the Q1 were Felipe Massa (Williams), Daniil Kvyat (Toro Rosso), Lance Stroll (Williams), Marcus Ericsson (Sauber) and Pascal Wehrlein (Sauber). A day earlier, Felipe Massa had a nasty crash in the first Free Practice, skipping the FP2 and setting 16th time in the FP3. In the Q2, Hamilton was fastest again, setting the track record of 1.42.927, beating his teammate Valtteri Bottas. Five drivers who dropped out after the Q2 were Fernando Alonso (McLaren), Romain Grosjean (Haas), Kevin Magnussen (Haas), Carlos Sainz Jr (Toro Rosso) and Stoffel Vandoorne (McLaren). In the Q3, Hamilton rounded two blistering laps around 7km circuit, first 1.42.907 and then 1.42.553. 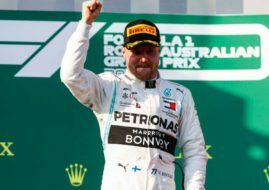 He was 0.242 seconds faster than Sebastian Vettel (Scuderia Ferrari) and 0.541 seconds faster then teammate Valtteri Bottas. Ferrari’s Kimi Raikkonen was slowed down by some problems to set the fourth fastest time. Other top 10 qualifiers were Max Verstappen (Red Bull), Daniel Ricciardo (Red Bull), Nico Hulkenberg (Renault), Sergio Perez (Force India), Esteban Ocon (Force India) and Jolyon Palmer (Renault).